MTR100 for 2017 | Sensor Technology Ltd. MTR100 for 2017 | Sensor Technology Ltd.
Sensor Technology Ltd. appears in the 2017 edition of Marine Technology Reporter magazine’s MTR100. The MTR100 is an “…annual ranking of the leading companies serving the global subsea industry”. We hold the other companies on the MTR100 in high regard. We are proud to be listed alongside them. Marine Technology Reporter introduced the MTR100 in 2006. Sensor Technology Ltd. first appeared on the list in 2008 and we’ve appeared every year since. That makes 2017 our tenth consecutive appearance! 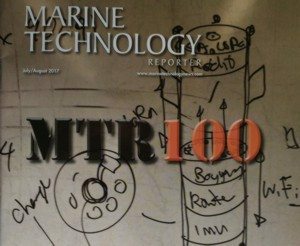 Download the 2017 edition of the MTR100 directly from the Marine Technology Reporter website here. Find Sensor Technology Ltd. listed on page 66.